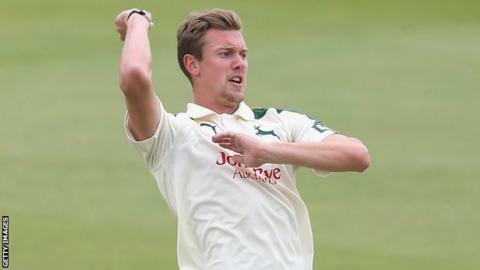 Jake Ball celebrated his England Lions call-up with four wickets as Nottinghamshire drew with Warwickshire. Resuming on 138, James Taylor (164) reached 9,000 first-class runs before being trapped lbw by Keith Barker (5-68). Nottinghamshire were bowled out for 365, before Ball (4-48) tore through Warwickshire's middle-order. Warwickshire were bowled out for 187, Laurie Evans (34) top-scoring, as Notts secured a third-place finish. Earlier in the day, Chris Wright (2-83) was on a hat-trick as he had Chris Read (62) caught behind, before Brett Hutton also edged to wicketkeeeper Tim Ambrose first ball. Luke Wood (36) denied the hat-trick, putting on 50 from just 60 balls with Luke Fletcher (24 not out), before Wood was bowled by Jeetan Patel (2-22). Ball was the last man to fall, lbw to his first ball from Patel as Nottinghamshire ended their first innings on 365. Warwickshire's reply began steadily, before captain Varun Chopra (25) fell lbw to Brett Hutton. Evans steadied the innings but Ball's introduction, where he dismissed Sam Hain (2), Tim Ambrose (8), Jonathan Trott (31) and Keith Barker (11), saw the home side slide from 103-2 to 153-7. Ball bowled with pace, breaking Patel's bat with one delivery, but Fletcher (2-40) and Hutton cleaned up Warwickshire's tail.